My father, Oliver Nugent (1915-1988), was born into the seventh generation of our family to reside in the Caribbean island of Antigua, to where Nugents migrated from Ireland at the start of the 18th century, having been on the losing side of the battle of the Boyne. This background fuelled his interest in the family’s history. He was especially fascinated by the circumstances of the departure from Ireland of our branch, the Nugents of Drumcree and, as he delved deeper, with the previous six hundred years that this once Norman family dwelt in Ireland. 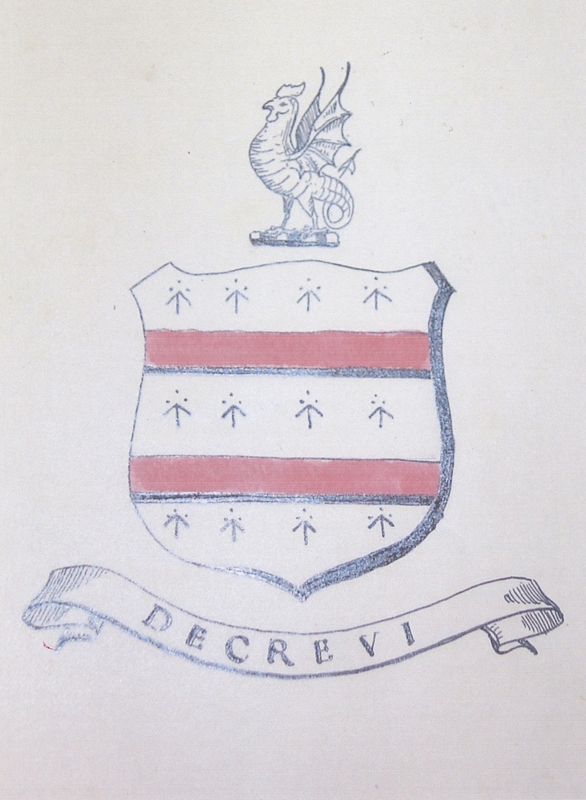 To assist in his research he had some remarkable resources, notably the work of the Irish genealogist, William Skey, MA, FSA, sometime St Patrick Poursuivant of Arms and Registrar of the Heralds Office in Dublin. Acting on a commission from a Mr Nugent of Farrenconnell, Skey researched Nugent history from its origins in Belesme, Normandy, around 993 up until 1849. He compiled a comprehensive family pedigree, subsequently updated to 1874, and left it in two forms, a narrative account and a pictorial ‘family tree’, which reside at the Genealogical Office in Dublin, the successor to the Herald’s Office which Skey once headed. 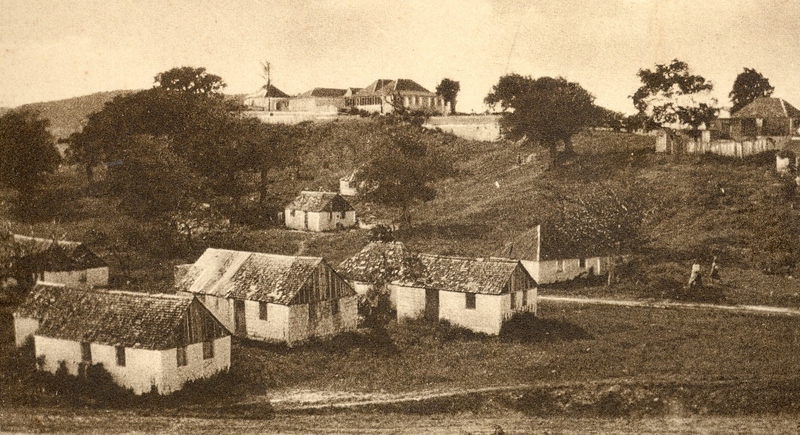 Versions of the family tree in the possession of the family originate from a copy made by my father’s aunt, Muriel C. Foster, whose brother and sister had both married ‘Antiguan’ Nugents. She added pedigrees of her own family, the Fosters of Baddesley, and other families related to the Nugents by marriage, the Birches, Donnes, De Stutevilles, Petres, Chanters, Ottleys, Byams and Warners. Great Aunt Muriel’s version remains in the Foster family whilst a subsequent copy made by my grandmother, Gladys Julia Nugent (nee Foster), and revised by my father is in my possession. This Family Book tells a fascinating story across more than a millennium starting in Normandy and moving to England, Ireland and Antigua then back to England, adocumentary record of which any family would be proud. Nugents, or de Nogents, fought alongside William I at Hastings and with Henry II in Ireland. The Nugent son of one of William’s division commanders at Hastings married the daughter of the third Norman king of England, Henry I. My father’s account tells of the family’s participation in both the Irish wars and the English Civil War of the seventeenth century and of the royal patronage they enjoyed from Elizabeth I, Charles I and II, James II, William III and Mary II before defeat at the Battle of the Boyne led our particular branch, the Drumcree Nugents, to migrate to Antigua. A son of the first Antiguan Nugent was created a baronet by George III and my great-great-grandfather Oliver was knighted by Queen Victoria. Incidentally, Sir Oliver Nugent, who died in 1894, is the first ancestor of whom I have a photograph. The associated family pedigrees show direct lines of descent from, among others, Edward I and Queen Eleanor of Castille, Sir Thomas More, the author of Utopia, and the poet and cleric Dr John Donne. Recently I met a member of the Ottley family and we were able to demonstrate, with help from the Family Book, that we are fifth cousins once removed! Had my father lived into his eighties he would have relished theopportunity for research presented by the internet and embarced digitalisation and scanning technology to complete the family history he had started to write. I remember discussing with him the possibility of creating a digital database of the membership of the London branch of the Irish Genealogical Research Society (IGRSOC) of which he was a Fellow and latterly treasurer. However, he died in 1988 aged 73 when personal computers were still in their infancy, before we could computerise the database let alone store digitally the fruits of his research. In his memory, I have now digitised the parts of the family history that he had completed as well as his major sources and am making these more widely available through this website www.NugentsofAntigua.net and associated e-mail NugentsofAntigua@gmail.comfor the benefit of students of Nugent history. Some of these files are large and will take time to download. Nugent Family Pedigree, by William Skey, 1849 with subsequent updates, pictorial version: the first millennium (aka ‘The Family Book’). [Associated family pedigrees of Fosters and others will follow in due course.] Download here. (118MB) This file is particularly large: your computer may freeze for upto 10 minutes while it downloads. Improvements will be made as new material becomes available. If you use any of these documents please send your feedback. My father wrote of V L Oliver’s three-volume ‘The History of Antigua’ published in limited edition: “My grandfather, Oliver Nugent, knew Mr Oliver and gave him some assistance, so it is reasonable to suppose that the family version and the ‘History’ were derived from the same copy of the original.” The importance of this source, especially on the crucial question of which Nugent first settled in Antigua, is apparent from my father’s account. In 1970 my father visited the Genealogical Office in Dublin and was shown “what purported to be” William Skey’s original manuscript as well as a fair copy of it which is the one usually produced on request. 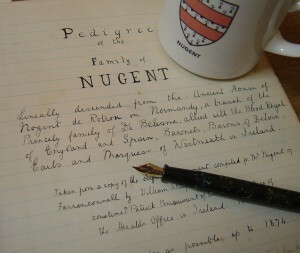 “I noticed a number of differences from the ‘Family Book’ version,” he wrote, “but time did not permit a full investigation.” Noting that the Genealogical Office holds a mass of information on various branches of the Nugent family, he went on: “For anyone with time and inclination there is enormous scope for research.” I hope that one day someone will take up that challenge.I encourage any researcher who picks up that challenge to start by using these four documents, which should be used together. I was fascinated by your research on the Nugents. 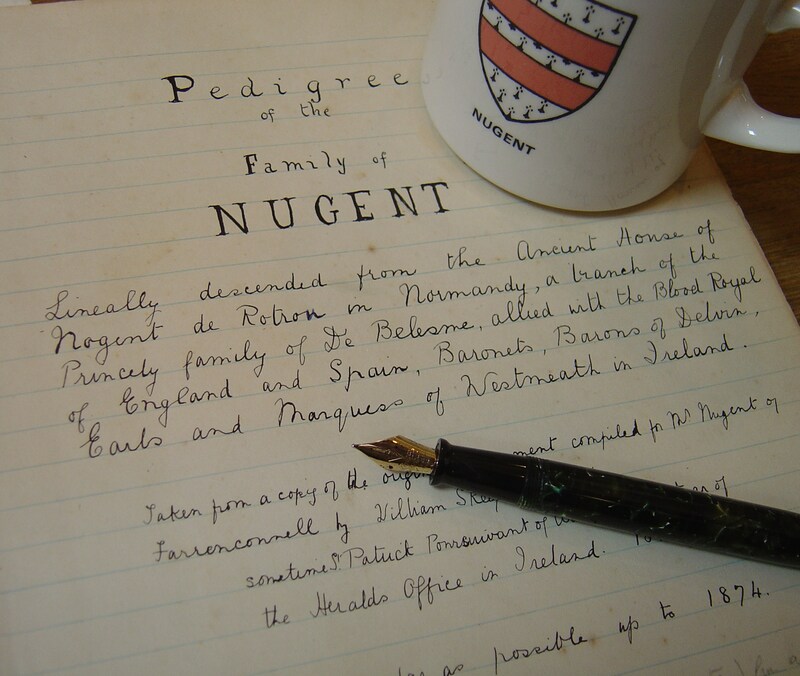 I became interested in that family name when I realised that an Elizabeth Nugent married a Major Francis Conmee from Kingsland, Boyle in Ireland in the 16th century. My family is descended from the Conmees of Kingsland. Do you have any information on the above mentioned liason? Would like to fill in the gaps. So far I have come up against a brick wall! Have you read the book ‘Power and Border Lordship in Medieval France’ by Kathleen Thompson? Is is all about the Nugents of Rotrou! He must have had best realations to King George III because he visited his brother-in-law Herzog Adolf Friederich von Mecklenburg-Strelitz. He wrote interesting books about traveling in Mecklenburg in 1766. But no one could tell me something about the family-background. Staying at the moment in Normandy on holiday which has sparked an interest in my family history. My. Father’s family I believe lived in Hemel Hampstead maybe before that from Ireland, and before that from Nogent le Retrou? have you any more info? Very interesting research Nicholas. Like Mary McEvoy (nee Conmee) in the previous comment, my partner’s line is also descended from major Francis Conmee Esq. & Elizabeth Nugent. Any information you have on this line would be gratefully received. Anne Tuite. Andrew and EllenNugent had 6 children. My husband Bernard was the only one who left Ireland.